One of the cheapest and easiest ways of increasing a laptop's speed is to upgrade RAM. 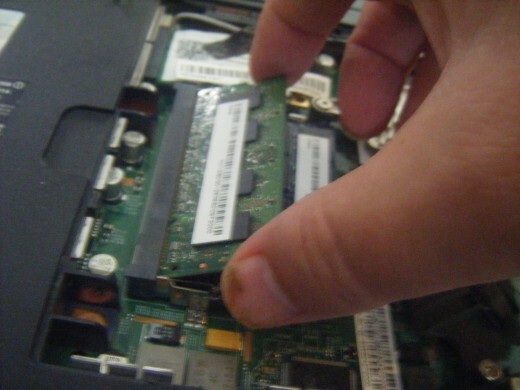 This guide gives step by step instructions on how to install laptop memory and upgrade RAM. The effect of replacing or adding more laptop memory cards can be dramatic in terms of improving the speed and performance of a laptop. Despite it being a relatively quick and easy procedure, it can transform a sluggishly slow machine that is barely usable into one that runs effortlessly. 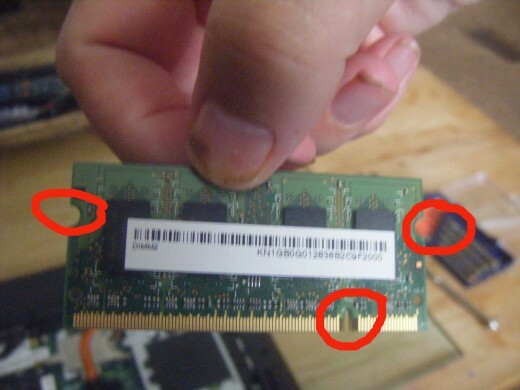 Even if you do not think you use your laptop for anything particularly taxing, you will still need to look at installing laptop memory in order to get more RAM after a few years. This is because the tendency is for computer programs to use more RAM each time that they upgrade, which means that gradually your laptop will struggle to cope, never mind perform well. Certain sorts of programs are particularly demanding, such as video games and large photo-editing suites, and require more RAM. Installing laptop memory can also mean that your laptop runs more smoothly wit h operating systems too, eg Windows Vista, which also tie up a lot of RAM. 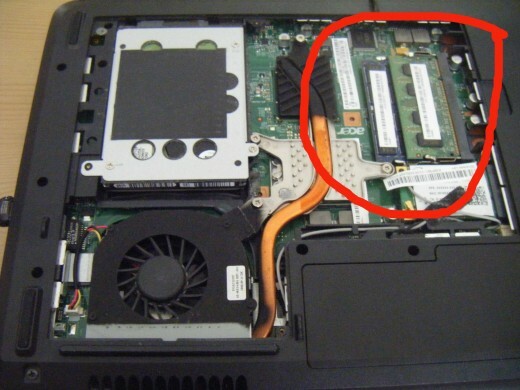 This article looks at how to install laptop memory to get more RAM, either by replacing the current memory card with one that holds more RAM, or by adding one of more extra memory cards. The procedure is actually pretty quick and simple and you do not need any specialist technical knowledge. I have taken used photos of one of my own laptops to illustrate this article. The laptop is an Acer Apire 5735, but I must stress that the procedure is very similar for pretty much all laptops. 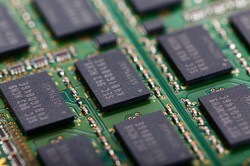 The main problem that you have to watch out for is that you identify and buy the right sort of memory. Installing laptop RAM is normally straightforward and the laptop should recognize the new RAM memory as soon as you restart. Before you do anything however, I would caution you about static. Laptops and computers generally can be very sensitive to static electricity. Wear an anti-static wrist strap, if possible. Failing that, try clutching something metal that is earthed beforehand to discharge any static build up. I would also work on the laptop on a wooden surface, like a table, rather than a carpeted floor. You should also make sure that the laptop is fully switched off and disconnected from the power supply before you begin work on it. Next you will need to turn your laptop over and take off the panel. 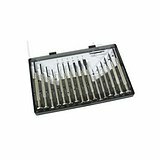 A set of jewelers screwdrivers is often useful when taking laptops apart, but you might be able to get away with a standard one. If you are unsure of what to do, check your manufacturers instructions. Be aware that opening up the laptop may also invalidate your warranty. Below in Figure 1 is a photo of the memory housed in my Acer laptop. Note the number of modules already installed (two in this case, one above another) and the number of available slots (also two in this case). The slots usually have ejector clips at each end to hold the memory modules in place and they need to be unfastened whenever you remove memory modules. You may also notice the slot key, a bump, which as well as the ejector clips, helps to make sure that the memory card is aligned correctly. To remove a memory card, unfasten the ejector clips, the memory card should then pop up so that it is at an angle. Now gently pull out the memory card (See figure 2). If you are storing it, you should use an anti-static bag. You will now need to put in your new memory. It is important that it is the correct type. The commonest type that you will find in modern laptops is the 144-pin SODIMM RAM memory module. If in doubt, take the old laptop memory into the store for comparison. You can also buy memory online at a competitive price. To fit the memory card, you need to do the removal procedure in reverse. Gently push the memory card into its slot, make sure that the ejector clips and slot key are aligned correctly, and push it down into place so that ejector clips fasten. When you are done, refasten the panel with your screwdriver, plug the laptop in and set it going. The new memory should be recognized straightaway and show up in boot up details when the computer comes on. TYVM ~ I did this a short while ago. Trial and error - I wish I had access to this then!